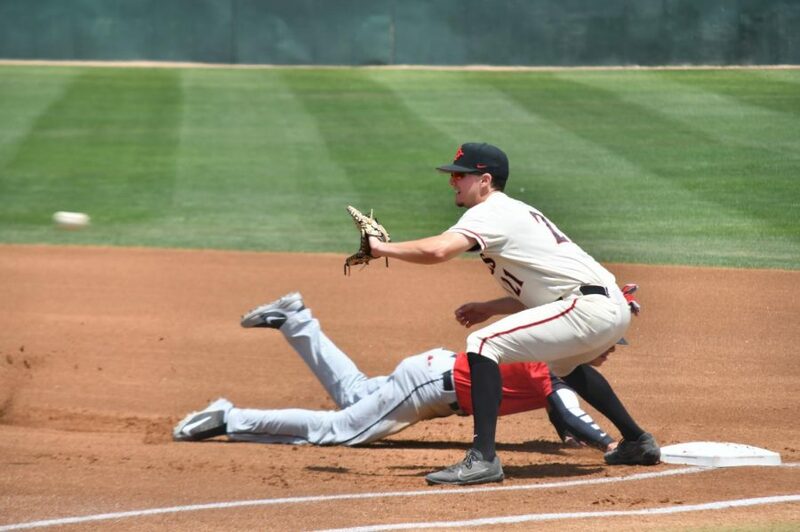 Junior first baseman Jordan Verdon attempts to pick off UNLV's Bryson Stott during the Aztecs 4-2 victory over the Rebels on April 29 at Tony Gwynn Stadium. 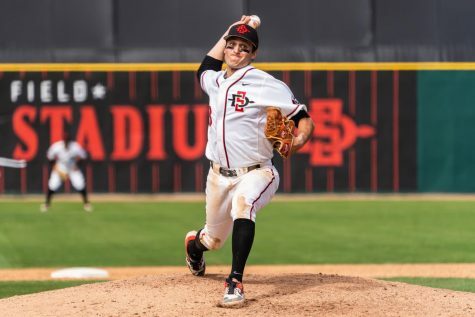 With six outs left and a conference series sweep on the line, San Diego State baseball handed the responsibility of securing the win in the hands of 19-year-old freshman Casey Schmitt. 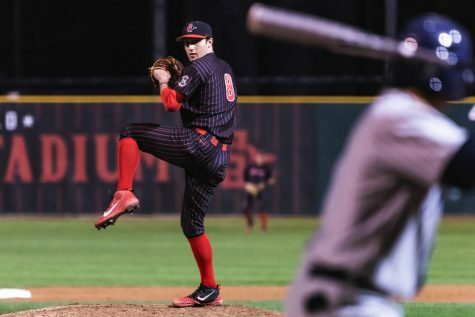 Schmitt did just that, allowing one hit in two innings to earn his seventh save of the season, giving SDSU the 4-2 victory and three game series sweep over the University of Nevada, Las Vegas on April 29 at Tony Gwynn Stadium. 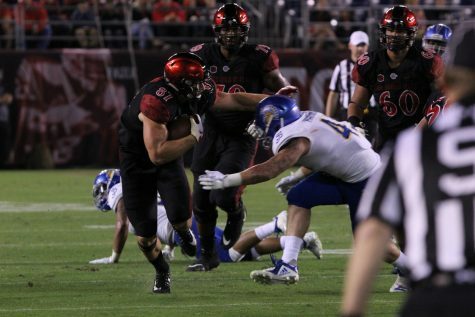 SDSU (30-14, 13-7 MW) now rides a five game win streak heading into the final month of the season, and head coach Mark Martinez said his team will need to continue to improve and remain focused as the postseason nears. 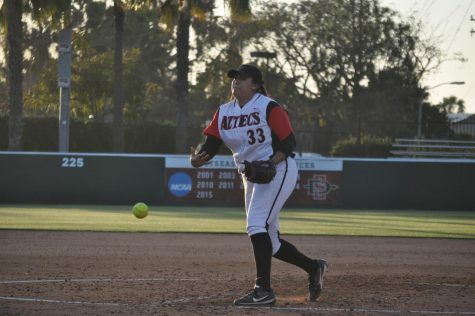 The Aztecs started junior pitcher Jorge Fernandez, who came into the game with a 4-3 record and a 3.34 ERA, while UNLV (29-17, 10-11 MW) started sophomore pitcher Trevor Horn, who had a 3-3 record and a 7.17 ERA. Fernandez earned the win, finishing with 5.1 innings pitched, two earned runs, five hits, five strikeouts and two walks. 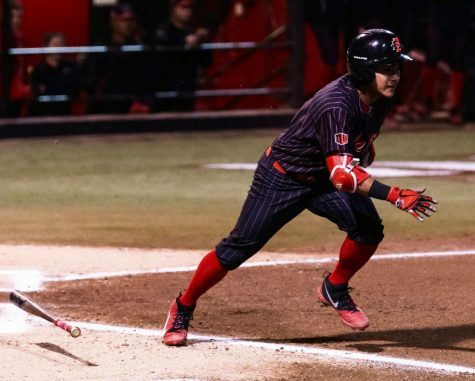 The Aztecs victory can be traced back to a three run fourth inning, which gave the team a lead they would maintain for the rest of the game. SDSU opened their big fourth inning with junior first baseman Jordan Verdon’s RBI double, giving the Aztecs a 1-0 lead. Sophomore outfielder Julian Escobedo continued the inning with a single to left field that would score another run, resulting in a 2-0 lead. Chad Bible joined in on the action after a would-be pop out was dropped by UNLV outfielder Max Smith, allowing another run to score for the Aztecs. 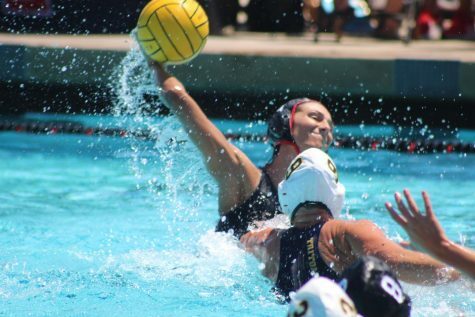 Bible said that although the Aztecs didn’t play perfect, they did enough to finish with the win. “It was a hard fought game, we didn’t have our best stuff today but we grinded out and got the runs we needed to get and our pitchers did really well it was whole team effort,” Bible said. SDSU added one more run to their total in the bottom of the seventh, after an RBI single by senior right fielder Chase Calabuig. 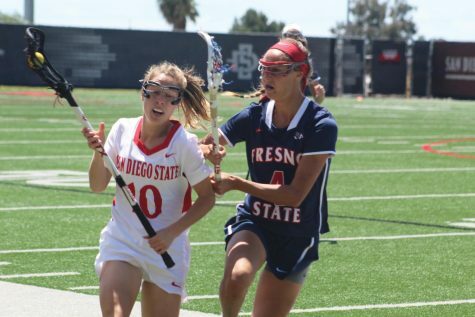 The Aztecs sit in second place in the Mountain West Conference standings with a 13-7 conference record, only 1.5 games behind University of Nevada, Reno for first place. 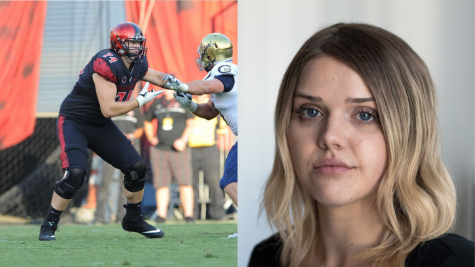 SDSU will be back at Tony Gwynn Stadium on May 1, when the team will play host to UC Riverside.